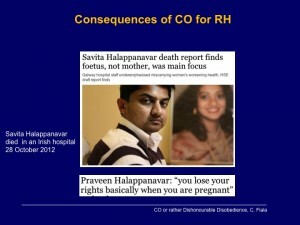 Once the basic principle of CO is accepted in reproductive healthcare, it becomes impossible to control or limit. Who will be in charge of deciding? Where does it stop? What criteria will determine the limits? Who will enforce it? And what are the sanctions? 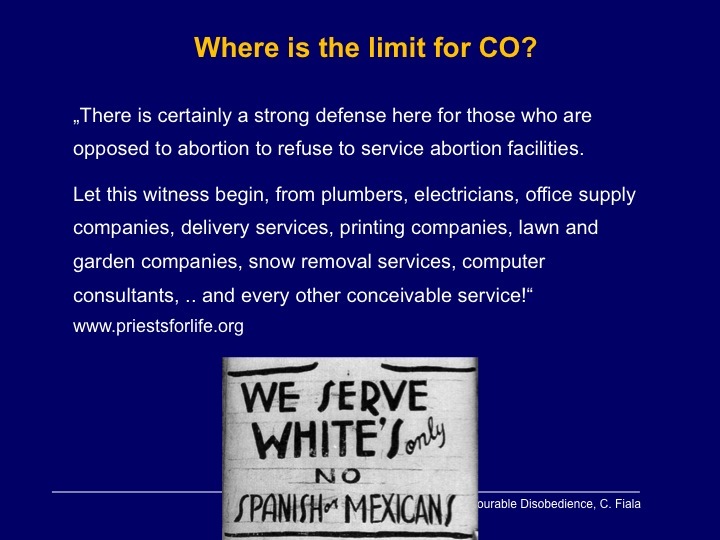 Currently, legal provisions for CO are routinely abused by anti-choice healthcare personnel (Cook and Dickens, 2006 and Dickens, 2006), who are usually not disciplined for it. Most CO laws and policies require doctors to refer appropriately to another doctor who will provide the service – what we call “limited CO” – but this often does not happen because many anti-choice healthcare workers believe that even giving information or a referral violates their conscience. Such workers will sometimes break the law or even commit malpractice – they may refuse outright to refer, make an inappropriate referral to an anti-choice “counselling” agency, treat the patient disrespectfully, fail to disclose the services they will not provide or why, refuse to give any information on options, provide misinformation on options, or delay a referral until it is too late for an abortion (CARAL, 2003). • In Poland, women who qualify for a legal abortion are entitled to a certificate that they must present to get an abortion, but doctors will often refuse to provide one when they should, or improperly declare a certificate “invalid” when one is presented to them (Reuters, 2007). 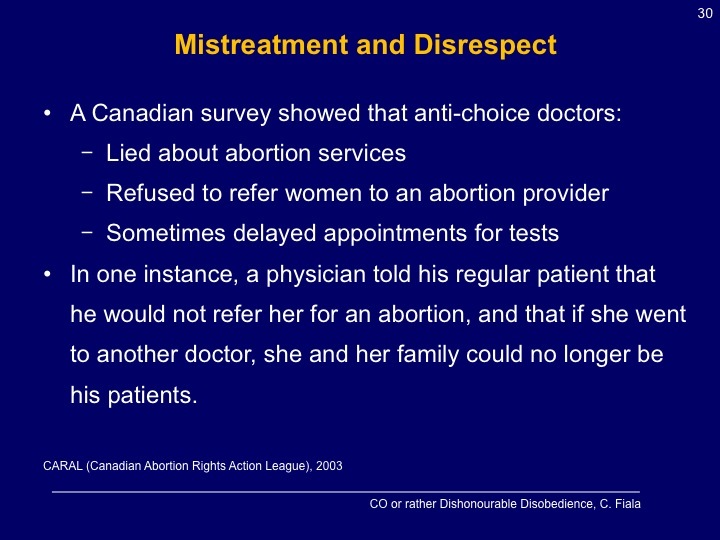 • In a Canadian survey (CARAL, 2003): “Anti-choice doctors were noted for lying about abortion services, claiming that there was not enough time to do the abortion, or that a hospital might not provide services after eight weeks”. Not only did many anti-choice doctors flatly refuse to refer women to an abortion provider, they “sometimes delayed appointments for tests until the pregnancy was too advanced to be eligible for the procedure”. In one instance, a physician told his regular patient that he “would no longer provide medical care in the future should [she] proceed with an abortion”. • In Idaho, an anti-choice pharmacist abused the state’s conscience law by refusing to dispense Methergine, a non-abortifacient drug that prevents or controls bleeding, because the pharmacist suspected that the woman may have had an abortion. In addition, the pharmacist rudely refused to refer the woman to another pharmacy (Miller, 2011). From the perspective of a doctor with a conscientious objection to abortion, referral to another practitioner is like saying, ‘I can’t rob the bank for you myself. But I know someone down the road who can.’ In other words, referral involves becoming complicit in the abortion. 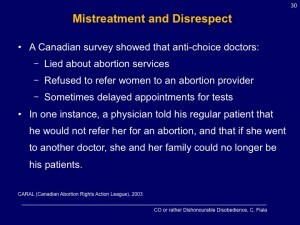 It is therefore something that healthcare practitioners with an objection to abortion rightly refuse to do. Similar convictions were stated by a Canadian anti-choice pharmacist who refuses to make referrals for emergency contraception prescriptions: “I will not direct people to a source of life-taking medicine. I cannot collaborate in the modern Holocaust.” (Grady, 2006b) Since objectors often view a referral as equivalent to doing the procedure themselves, limited CO is inherently contradictory and therefore unworkable. In effect, a referral requirement tries to mitigate the harm of CO but permits that harm to occur. CO regulations also require objectors to provide emergency care, but some doctors will risk a woman’s death rather than perform an abortion. In Poland, even though abortion is legal to save a woman’s life, doctors let a woman die out of concern that treating her for her colon disease might harm the foetus (Center for Reproductive Rights, 2010). 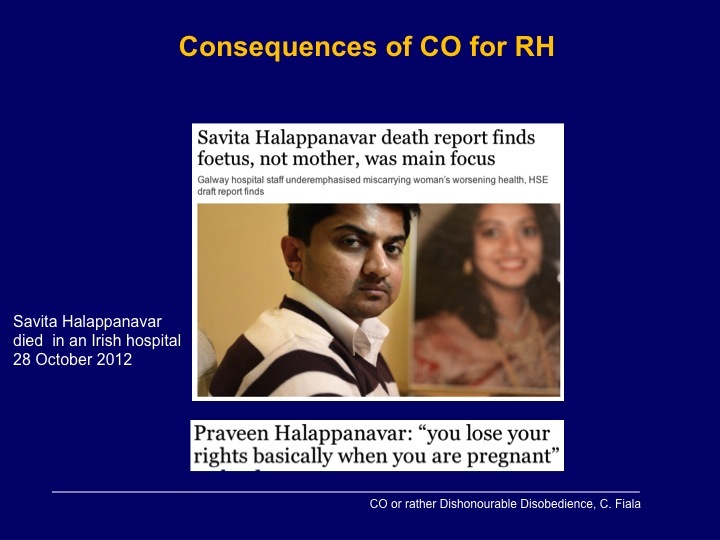 In a highly publicized 2012 case, Savita Halappanavar died of sepsis in an Irish hospital three days after doctors refused to end her doomed pregnancy because her foetus still had a heartbeat (Berer, 2013). In any case, the legal requirement to provide a service in a life-threatening situation is unworkable by definition. It is usually impossible to determine with certainty whether any medical case is truly life-endangering and to what degree – until the patient actually dies. Differing medical opinions on the risk of death means that some will advise a “wait and see” approach until it is too late. When it comes to abortion, the loudest voices urging a delay are often guided by personal beliefs, not medical knowledge and skills, especially in restrictive social environments hostile to abortion rights. Granting the basic right to CO sets a precedent that can lead to dramatic extensions of CO to other areas, as well as confusion on where to draw the line. The George W. Bush administration tried to expand the legal right of CO to any public healthcare worker in the U.S. for almost any reason. Although the regulation was mostly rescinded by President Obama in 2011, it represented a serious abuse of CO because of the potential for inflicting increased harms on ever-larger numbers of patients. Further, when the U.S. government included a provision requiring full coverage of contraception in its landmark healthcare legislation enacted in 2012, it triggered many lawsuits from religious organizations and private companies, claiming that paying for their employees’ birth control would violate their faith. The issue will likely end up at the Supreme Court because of “strong disagreements” at lower court levels (Bronner, 2013), potentially leaving millions of women at the mercy of their employers’ religious beliefs. There is certainly a strong defense here for those who are opposed to abortion to refuse to service abortion facilities. Let this witness begin, from plumbers, electricians, office supply companies, delivery services, printing companies, lawn and garden companies, snow removal services, computer consultants, office machine repair services, sanitation workers, roofing companies, taxi drivers, security companies, lock and key companies, cleaning and maintenance services, sign and fence companies, food services, exterminators, and every other conceivable service! In practice, various factors can lead to situations where women’s access to lawful medical care is affected. The mostly widely observed reasons are the lack of oversight mechanisms ensuring the implementation of existing legal provisions and policies, the non-respect of legal duties with regard to the information of patients, the absence of regulations requiring or facilitating timely action (notification of conscientious objection, appeals processes, etc. ), as well as the lack of regulation regarding the scope of conscientious objection provisions. Perhaps defining and enforcing CO regulations more consistently could mitigate the abuse of CO and help more patients access services they are entitled to. However, we argue that the systemic abuse of CO is not a mere sign of an imperfect world; rather, it indicates that such abuse is inherent in the very acceptance of CO, making laws and policies on limited CO essentially unenforceable. Endorsing CO means endorsing the principle that individual beliefs trump the health and lives of people who need a medical service.